Added on April 9, 2014 by Wendy Cheng. Asian American Studies has increasingly welcomed transnational and diasporic methods and themes, even as it maintained the need for the status of the field as separate from Asian Studies and Asian Diaspora Studies. In keeping with the theme of this year’s conference, “Building Bridges, Forging Movements,” our panel proposes to take stock of the varied political and critical possibilities generated from the meeting of these different epistemological projects. In their papers, Steven Lee and Wendy Cheng examine how particular diasporic histories—Korean and Taiwanese, respectively—have enlivened political imaginaries for postcolonial nationalism and political formation that have profound implication for not only homeland nations, but for the orientation of Asian Americanist politics and critique. Jian Chen and Crystal Parikh, on the other hand, consider how transnational media, infrastructure, and discourses open the “subjectless discourse” (in Kandice Chuh’s now well-known formulation) of Asian American Studies towards affiliations and claims that are otherwise foreclosed from a domestic imaginary within the United States. As a whole, the panel asks what it means not only to “slide over” the “racial frontier” between Asia and America—about which the panel chair David Palumbo-Liu has written so compellingly in Asian/American—but the implications of an Asian American Studies that is “all over the place,” in terms of its objects, methods, and aspirations. Added on March 24, 2014 by Wendy Cheng. Added on February 18, 2014 by Wendy Cheng. Please join us for Arquitectura Contemporánea, a discussion that takes a critical look at the representation of architecture and the changes in urban landscapes: specifically in terms of architectural guidebooks, and more generally with the interconnection between architecture and photography through time-based documentary and art works. Artists Christoph Draeger and Heidrun Holzfeind will present their conceptual photo project Arquitectura Contemporánea, a remake of an architectural guidebook of the same name that chronicles 20th century architecture in Mexico City. The project will be published as a book later this year with editor Lorenzo Rocha, an architect and critic from Mexico City, who at the panel will speak about the intersection between photography and architecture in relation to the different ways a building can be contemporary. Photographer and writer Wendy Cheng will discuss A People's Guide to Los Angeles (University of California Press, 2012), focusing on the historical, geographic, and political implications of guidebooks and how they inform how we interact with everyday landscapes, with specific reference to Los Angeles. She'll also touch on some of the visual and aesthetic challenges involved in the production of A People's Guide. Artist Alex Slade will discuss his photographs documenting sites of transformation across the US where the defining characteristics of today's American city are actualized. MAK Center director Kimberli Meyer will moderate the panel. Each panelist will make a fifteen-minute presentation, followed by a roundtable discussion. Lorenzo Rocha Cito is an architect and critic based in Mexico City, and former architect-in-residence at the MAK Center. All of his projects have been built in Mexico City and its hinterland. Editor of [ESPACIO] magazine since 2005 and regular contributor to Milenio newspaper for 8 years. He is the author of four books, the most recent: Essays on Photography and Architecture, published by Diamantina in 2011. Wendy Cheng is a writer and photographer. She is Assistant Professor of Asian Pacific American Studies and Justice & Social Inquiry in the School of Social Transformation, at Arizona State University. She is the author of The Changs Next Door to the Díazes: Remapping Race in Suburban California (University of Minnesota Press, 2013) and coauthor and photographer of A People's Guide to Los Angeles (University of California Press, 2012). Her essays and articles have appeared in publications including American Quarterly, Journal of Urban History, and the Los Angeles Review of Books. Cheng is a past recipient of the Dorothea Lange Fellowship for documentary photography and the George Peabody Gardner Traveling Fellowship. Christoph Draeger is an artist who has been working with themes of disaster and destruction for over twenty years. His projects take form in installation, video, and photo-based media to explore issues pertaining to catastrophe and media-saturated culture. His work has been the focus of solo exhibitions at Kunstzeughaus Rapperswil (Switzerland), OK Centrum (Linz), Kunsthaus Zurich, Roebling Hall (New York), Center for Contemporary Art (Warsaw); and included in group exhibitions at the Whitney Museum, Brooklyn Museum, New Museum, MoMA, P.S.1, Van Abbe Museum Eindhoven, Museo de Arte Carrillo Gil (Mexico City), Centre Pompidou, Paco das Artes (Sao Paulo), Museum der Moderne (Salzburg), KW Institute (Berlin), as well as biennials in Gwangju, Havanna, Liverpool, Moscow, and Venice. Heidrun Holzfeind is a current artist-in-residence at the MAK Center, interested in how architecture interacts with people's everyday life. She questions immanent architectural and social utopias of modernist residential buildings, exploring the borders between history and identity, individual histories and political narratives of the present. Her work has been shown at the Maldives Pavilion at the 55th Venice Biennale, BAWAG Contemporary (Vienna), Mumok (Vienna), MoMA, Camera Austria, (Graz), CCS Bard, Lentos Museum (Linz), Manifesta 7 (Italy), SAPS (Mexico City),Center for Contemporary Art (Warsaw), Artists Space (New York), and other venues. She is the recipient of the Camera Austria prize for contemporary photography (2011), the Gerhard and Birgit Gmoser Prize for Contemporary Art, Secession Vienna (2011) and the Outstanding Artist award for photography (2012) of the Austrian Arts Council. Alex Slade is an artist working in both photography and sculpture. His work has been included in exhibitions throughout the US and internationally. Exhibition venues include Edward Cella Art + Architecture (Los Angeles), Santa Monica Museum of Art, MoMA, MOCA Miami, Liverpool Biennial, Prague Biennial, Kunstlerhaus Bethanien (Berlin), and the San Francisco Art Institute. Slade is a graduate of CalArts, and currently resides and works in Los Angeles where he is the Assistant Chair of the Fine Arts Department at Otis College of Art and Design. Image: Christoph Draeger and Heidrun Holzfeind, Arquitectura Contemporánea, 2007. The MAK Center for Art and Architecture at the Schindler House is located at 835 North Kings Road in West Hollywood. Public hours are Wednesday through Sunday, 11 AM-6 PM. Regular admission is $7/$17 with the guidebook, Schindler By MAK; students and seniors, $6/$16 with book; free for Friends of the MAK Center and on Fridays, 4-6 PM. Parking is available at the public structure at the northeast corner of Kings Road and Santa Monica Boulevard. Added on February 10, 2014 by Wendy Cheng. Enjoyed Alhambra Source reporter Alfred Dicioco's February 6 piece on the Crawford Family Forum event. Check it out here. Added on January 29, 2014 by Wendy Cheng. On January 6, 2014, Sonali Kolhatkar interviewed me about Asian Americans and Latinas/os in the San Gabriel Valley. It's paired with an excellent interview with Pomona professor Gilda Ochoa on the academic ramifications of these racial dynamics. Listen here. I will be participating in an event at KPCC's Crawford Family Forum in Pasadena on Thursday, January 30, to discuss my new book, The Changs Next Door to the Díazes: Remapping Race in Suburban California. With SCPR reporter Leslie Berestein Rojas. More information here. Read a Q&A between me and Leslie Berestein Rojas here. Upcoming Event in Long Beach: "Shadow Landscapes: Hidden in Plain Sight"
Added on August 14, 2013 by Wendy Cheng. Today more Californians are “home-grown,” born here not elsewhere, with signs of age. How do the cultural boundaries of the past reveal our present day map and the landscape we share in common? Gustavo Arelleno, Editor of the OC Weekly and author of the nationally bestselling book (and column) ¡Ask a Mexican! ; Orange County: A Personal History; and TACO USA: How Mexican Food Conquered America. He has appeared on the Today Show, Nightline, Talk of the Nation on NPR, and The Colbert Report. Philip Ethington, Professor of History, University of Southern California, and multi-media historian, cartographer, photographer, and award-winning film writer, whose interactive work has been exhibited at The Getty, LACMA, and internationally. Wendy Cheng, Assistant Professor, Arizona State University, and author of The Changs Next Door to the Diazes: Remapping Race in Suburban California (Fall 2013), and co-author of A People’s Guide to Los Angeles. Susan Straight, Distinguished Professor of Creative Writing, University of California Riverside, and awarded author of eight acclaimed novels including stories about the African American community. She has written for the The New York Times, Reader’s Digest, Salon, Harpers, andThe Nation among many notable publications. Oliver Wang, Assistant Professor of Sociology, California State University Long Beach, and leading expert on the intersection of race, ethnicity, media, pop culture and the hip hop phenomenon in the Asian community. He writes for All Things Considered, the Los Angeles Times, Wax Poetics, and is co-author of Classic Material: The Hip-Hop Album Guide, among other works. Claudia Jurmain, Director, Special Projects at The Rancho and co-author of the award winning books Rancho Los Alamitos—Ever Changing, Always the Same and O, My Ancestors: Recognition and Renewal of the Gabrielino-Tongva People of the Los Angeles Area. D.J.Waldie, renowned author, historian cultural commentator, and life-time resident of Lakewood, California, hailed as a ‘gorgeous distiller of architectural and social history” by the New York Times. Free parking for this event will be at CSULB Lot 11 with free continuous, handicap accessible shuttle service to the Rancho. Added on March 30, 2013 by Wendy Cheng. If you are planning on attending the upcoming Association of American Geographers' Annual Meeting in Los Angeles, we'll be doing two People's Guide to LA-related events. Please join us! Session Description: A People's Guide to Los Angeles is not a travel guide that narrates the glitz and glamour of Los Angeles. Pulido, Barraclough and Cheng through an innovative alternative tourism framework, challenge us to recover silenced, buried, absent landscapes from hegemonic representations of Los Angeles. A People's guide documents 115 sites that actively informed the production of subaltern Los Angeles. While these spaces are sites of complex struggles in the history of L.A. County they are also important in understanding the way power has shaped El Pueblo de Nuestra Señora la Reina de los Ángeles into a megaregion. Break out of downtown LA’s luxury hotel zone and consumer playground to learn about the city’s power relations. Led by the authors of A People’s Guide to Los Angeles, this tour examines downtown’s landscapes of oppression, struggle, and resistance. Stops include the former offices of the Partido Liberal Mexicano, a revolutionary anarchist group; muralist David Siqueiros’ Tropical America, which critiques U.S. imperialism; Yang-Na, the region’s largest indigenous settlement before colonization; Downey Block, where enslaved native Americans were auctioned; and Biddy Mason Park, honoring a freed slave who became an influential businesswoman and leader. Bring $20 cash for lunch and public transit. Added on February 26, 2013 by Wendy Cheng. Laura Pulido and I will be reading from A People's Guide to Los Angeles at the Southern California Library on Saturday, March 9, at 1pm. 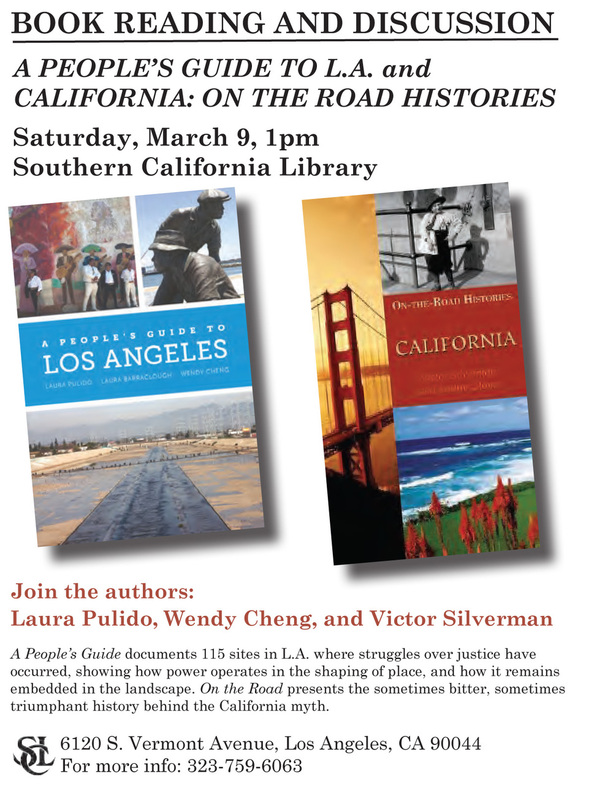 Author Victor Silverman will also be reading from California: On-the-Road Histories.